We managed to capture everything in a single shot: a herd of bison, our beloved Cloud 9 in the side mirror of our amazing F-150, and the relatively short gap (maybe 25 feet?) between the herd and us. Notice that the only thing separating us is the road’s gravel shoulder. As Jon took the shot, Cliff commanded the dogs, “No bark!” Of course, Bella barked at once, as if to taunt the bison: “Bring it!” No need to worry, however, because the woman in the car behind our trailer, which is also visible in our mirror, proved to be a much more tempting target. She actually got out of her car and approached the herd for a selfie. What part of “Stay 25 yards away from bison” didn’t she understand? 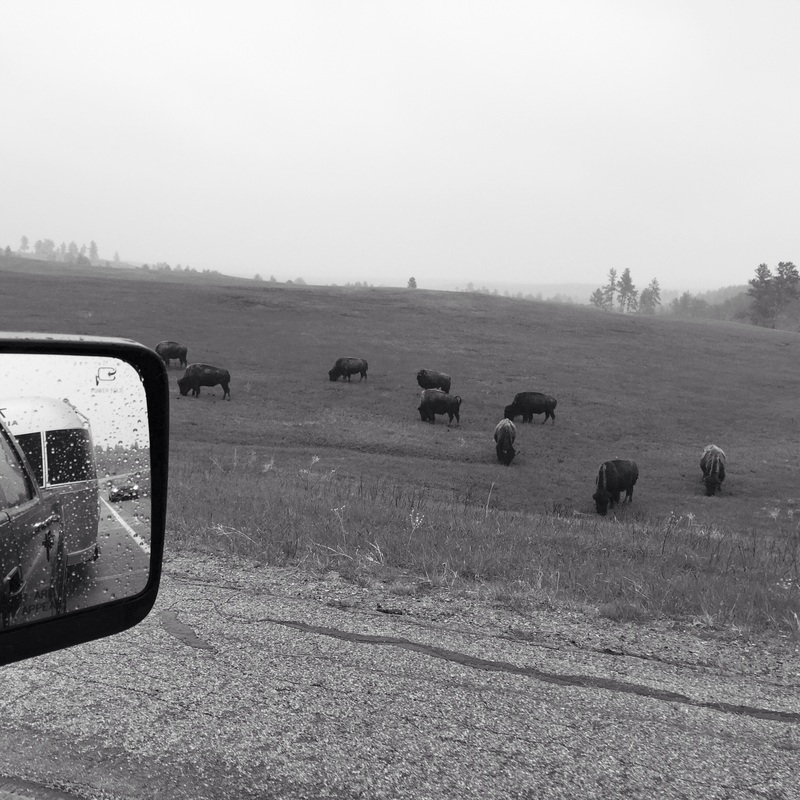 Our close encounter of the herd kind came at the end of a long day of driving through wind and rain and fog, as well as parts of Kansas, Colorado, Nebraska and South Dakota. The day began with our KOA host in WaKeeney serving up fluffy pancakes, sausage and a side of Christian witness–exactly the type of breakfast we needed to carry us over hundreds of miles of hellish terrain. We wouldn’t eat again for nearly five hours, when we picked up some convenience store grub in some forgettable isolated town. In between, and long afterward, we traveled through varying degrees of rain and fog and mist. The roads, for the most part, were well maintained with clear signage that made navigation a breeze, even in inclement weather. Our biggest regret: We weren’t able to enjoy much of the Badlands scenery because of the rain. But we arrived at our destination campsite in Custer safe, sound, and almost on time. After cleaning up dog urine in the truck and a broken glass in the camper, we were finally ready to retrieve some level of normal rountine as we sat down to watch the evening news (recorded, of course–our timing isn’t that great) and enjoy our favorite cocktails. Then Chef Cliff took to the grill and made some amazing Wagu beef steaks, grilled potatoes, asparagus with hollandaise sauce and charred peppers, all complemented with a Due Mari 2012 Primitivo. Marvelous. As usual, we learned a few things from today’s travel. First: Vacation days that include rain require twice as much effort yet result in only half as much enjoyment. Second: It’s nearly impossible to carry on a meaningful conversation with high school girls who are working a summer job at a KOA in rural Kansas, so don’t even try. Third: The selfie you take with the wild bison will not only generate a lot of “Likes” on Facebook but will also look great enlarged and mounted on a tripod placed next to your closed casket at your funeral. Tomorrow: Mount Rushmore and the Grand Titons. May 23, 2015 in Adventures, Cloud 9. ← At Long Last, WaKeeney!